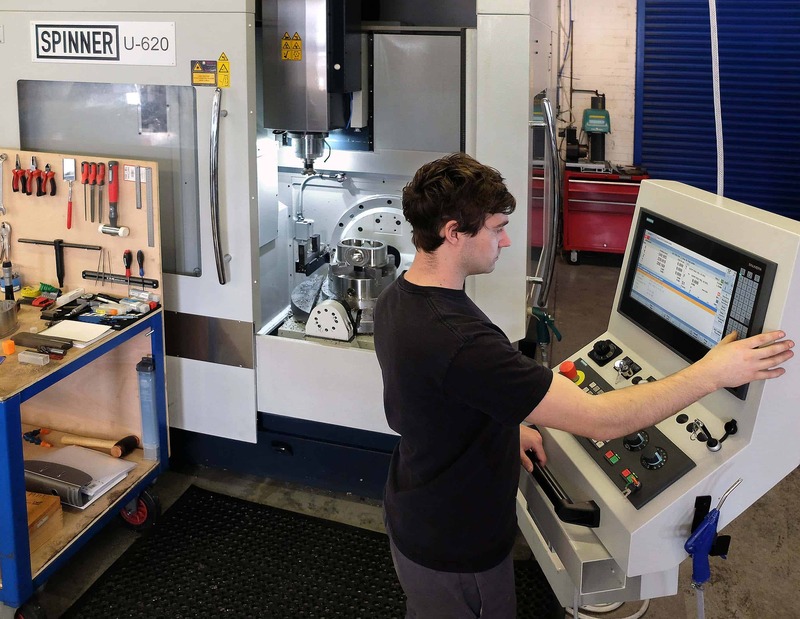 Hailsham, East Sussex-based subcontractor, Dicker Precision, has decided to move its prismatic machining capability forward with the purchase of its first 5-axis, vertical-spindle machining centre (VMC). 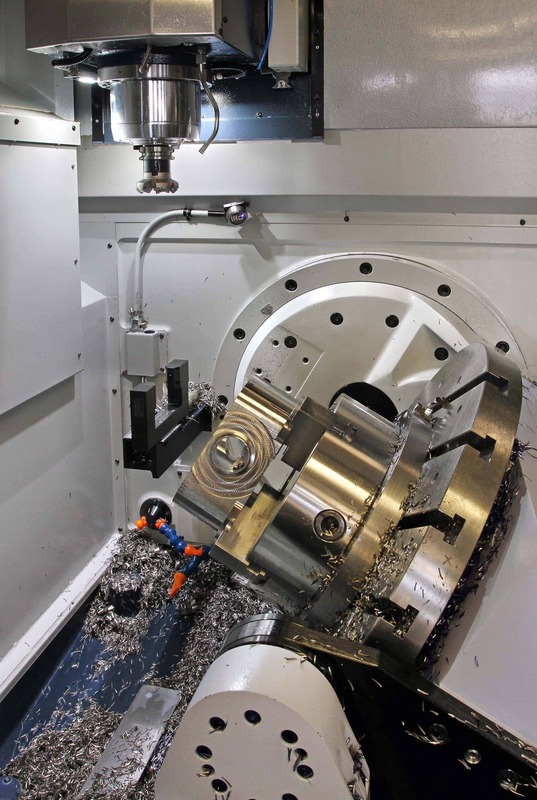 It is a German-built Spinner U620 Compact, supplied as a turnkey package with tooling, the initial part program and training by UK and Ireland agent, Whitehouse Machine Tools, Kenilworth. 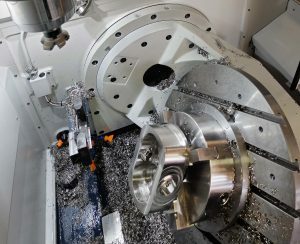 Deputy systems manager Brandon Love, son of the subcontractor’s second-generation managing director, Mark, explained the reason for buying the machine in January 2018 and why the firm opted for a model capable of interpolating four of the five CNC axes simultaneously, rather than all of them. 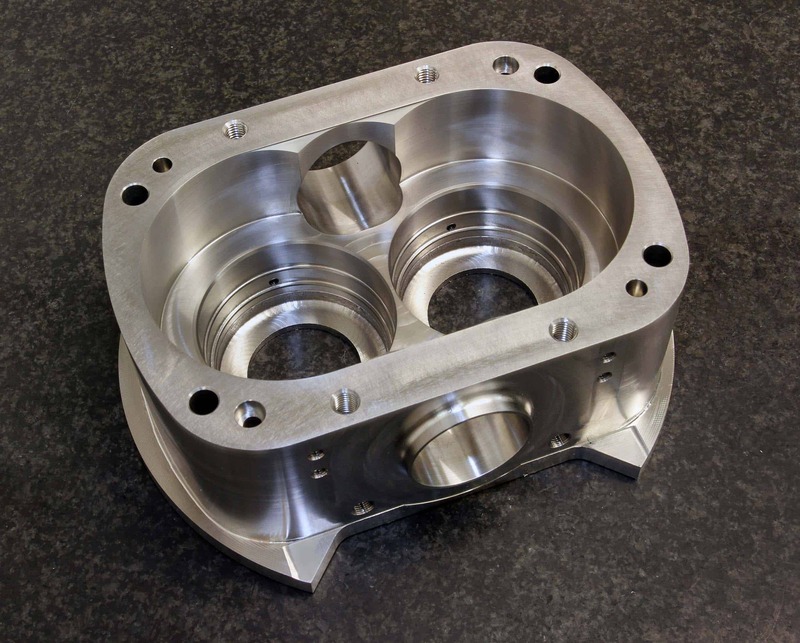 Brandon said, “The investment was triggered about a year ago by one of our existing customers asking for nine variants of a pump housing to be machined from solid 316 stainless steel. Some features have tight tolerances, such as 30 microns on hole diameter and 20 microns on position. We started off machining them on a three-axis VMC using indexable-insert boring bars, high-speed steel rippers and various other tooling including taps. It took four hours to complete each housing in five operations. Quite frankly, we were finding it difficult to make any profit on the contract. To make this a reality and improve the economy of production, however, either a 5-axis VMC or a 4-axis horizontal machining centre was needed and both were considered. The vertical-spindle route was chosen due to the greater versatility that it offered for future contracts and also the smaller footprint for a given working volume. In this respect, the Spinner machine has a particularly good ratio. Luckily, the quantity of the new pump housings rose during last year to between 20 and 40 per month, which justified the purchase of a new machine. Dicker Precision already had experience of working with Whitehouse Machine Tools, which had delivered an Italian-built Biglia twin-spindle CNC bar auto with two Y-axis turrets to the Hailsham factory to streamline the production of a family of aluminium switch cover assemblies. Brandon continued, “Whitehouse provides a turnkey solution. They do everything for you, whereas some suppliers just deliver a machine and you’re lucky if they tell you how to turn it on and off. We looked at various options but the positive experience with the Biglia lathe package prompted us to return to the same source for the 5-axis machining centre. Whitehouse did a time study on the first part, wrote the program and advised that the job could be done twice as fast with solid carbide end mills rather than indexable-insert tooling – in two hours rather than four, including handling. The U620 Compact was producing the pump housings within two days of arriving on the shop floor. Based on the machine’s hourly rate, halving the cycle time results in £200 being saved on the production of each component. Admittedly, £60 was spent on carbide inserts for each component whereas the tooling cost is double using solid carbide, but nevertheless the reduction in manufacturing cost is considerable and will help to amortise the cost of the machine quickly. It should be pointed out that the savings described are gained only from Op 1 on the top of the housing, a three-axis VMC being retained for the simpler, 15-minute Op 2 on the reverse. Unsurprisingly, owing to the reduction in the number of operations, lead-time from start of production to delivery of a batch is down from one and a half weeks to three days, with two days the aim. Another big advantage is the repeatability of the process, which is largely down to the rigidity of the Spinner machine and the absence of tolerance build-up. It has elicited a comment from the customer that the current components are of significantly better quality. All housings delivered were within tolerance before, but some might have been near the top or bottom limit, causing niggles during pump assembly. Now dimensions are all close to the centre of the tolerance bands, making life easier for the customer. As to the choice of a 4+1-axis version of the U620 Compact, where one of the rotational axes is positional only rather than capable of being interpolated with the other four, Brandon explained, “One factor was that the 4+1-axis machine costs around 15 per cent less than the full 5-axis version. In any case, we are currently using ours in 3+2-axis mode to manufacture the pump housings. The latest pump housing contract occupies the Spinner for half of its time over a single day shift, so there is spare capacity. The next job is already lined up for the machine – an aluminium pneumatic block for the automotive industry that requires 5-sided machining. Similar jobs have been done in the past by Dicker Precision but it has been difficult to hit the price asked. That will be no problem using the 5-axis machine, according to Brandon. He concluded, “More and more jobs these days have tighter tolerances and require a higher standard of surface finish. Machines like the Spinner help us to achieve the specifications.